This section provides you with information you need before you can perform an installation from the network. Network installations enable you to install the Solaris software from a system, called an install server, that has access to the current Solaris release disc images. You copy the contents of the current Solaris release DVD or CD media to the install server's hard disk. Then, you can install the Solaris software from the network by using any of the Solaris installation methods. To install the Solaris OS from the network, the systems to be installed require the following servers to be present on the network. Note - Starting with the Oracle Solaris 10 9/10 release, only a DVD is provided. Solaris Software CDs are no longer provided. After you copy the image from the Solaris Software CDs, you can also copy the image from the Solaris Languages CDs as necessary for your installation requirements. You can enable a single install server to provide disc images for different Solaris releases and for multiple platforms by copying the images on to the install server's hard disk. For example, a single install server could contain the disc images for the SPARC platform and x86 platform. For details about how to create an install server, refer to one of the following sections. 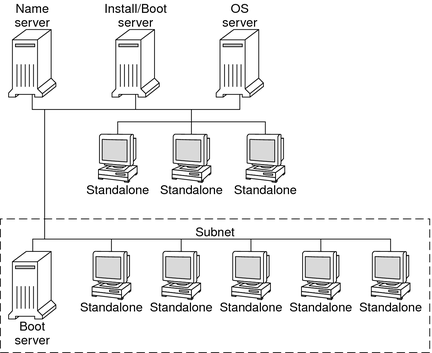 Boot server – A server system that provides client systems on the same network subnet with the information that they need to boot in order to install the OS. A boot server and install server are typically the same system. However, if the system on which the current Solaris release is to be installed is located in a different subnet than the install server and you are not using DHCP, a boot server is required on that subnet. A single boot server can provide current Solaris release boot software for multiple releases, including the current Solaris release boot software for different platforms. For example, a SPARC boot server can provide the Solaris 9 and current Solaris release boot software for SPARC based systems. The same SPARC boot server can also provide the current Solaris release boot software for x86 based systems. Note - When using DHCP, you do not need to create a separate boot server. For more information, see Preconfiguring System Configuration Information With the DHCP Service (Tasks). (Optional) DHCP server – A server that uses the Dynamic Host Configuration Protocol (DHCP) to provide the network parameters that are necessary for installation. You can configure a DHCP server to configure and install specific clients, all clients on a specific network, or an entire class of clients. When using DHCP, you do not need to create a separate boot server. After you have created the install server, you add clients to the network with the add_install_client command and the -d option. The -d option enables you to set up client systems for Solaris installation from the network by using DHCP. For information on DHCP options for installation parameters, see Preconfiguring System Configuration Information With the DHCP Service (Tasks). (Optional) Name server – A system that manages a distributed network database, such as DNS, NIS, NIS+, or LDAP, that contains information about systems on the network. For details about how to create a name server, refer to System Administration Guide: Naming and Directory Services (DNS, NIS, and LDAP). Note - The install server and name server can be the same or different systems. Figure 4-1 illustrates the servers that are typically used for network installation. Note that this sample network does not include a DHCP server.